It hurts to say this, but the Wisconsin Court of Appeals got something right yesterday. It is far more fun when they get something wrong. But, fair is fair. In Baxter v. Baxter, 2013AP116, the trial court committed a common error by excluding an asset from the marital estate because it was premarital. 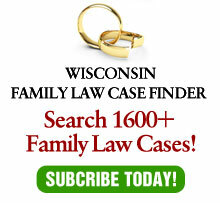 Such a ruling is contrary to Wisconsin’s equitable distribution rule in divorce property division and the court of appeals reversed with the correct reasoning. In a community property state, precommunity property is generally not divisible. While Wisconsin is a community property state in other areas (don’t ask why, please), divorce property division is an equitable distribution scheme. In most cases, this is an insignificant difference. But not always. In an ED state, the court is to presume an equal division of the marital estate. The court can then deviate from an equal division based on a large number of factors, one of which is the length of the marriage. So, in short term marriages (usually under 5 years), the court typically deviates from an equal division based on that factor. In this case, however, the trial court (who is fairly new to the bench and did not handle divorce cases as a practicing lawyer) said that it was his intent to divide the marital estate equally and then found that premarital property was not divisible. Wrong. As I said, this is a common mistake. I am used to trial courts saying exactly what the court said in this case. And kudos to the appellate court for getting it right. “Getting it right” meant ruling that only gifts and inheritances, whenever received, are exempt. Premarital property is merely a factor for the court to consider. I have every confidence that the court of appeals will go back to its usual ways soon and misread the statutes (e.g., how joint legal custody is defined) and make my life as a blogger more fun. Can’t wait!